Retail companies are in the middle of a seismic shift. Younger shoppers are taking over the market, and they have a penchant for online shopping. This means that older, brick-and-mortar sellers are struggling to keep up with online giants like Amazon. Home-products maker Procter & Gamble — think Tide detergent and Pampers diapers — laid out in one simple bar chart just how huge this shift has been. The slide, from a company presentation at an analyst conference this week, shows the monthly buying frequency of US shoppers in hypermarkets — stores with both grocery and department sections — and online. 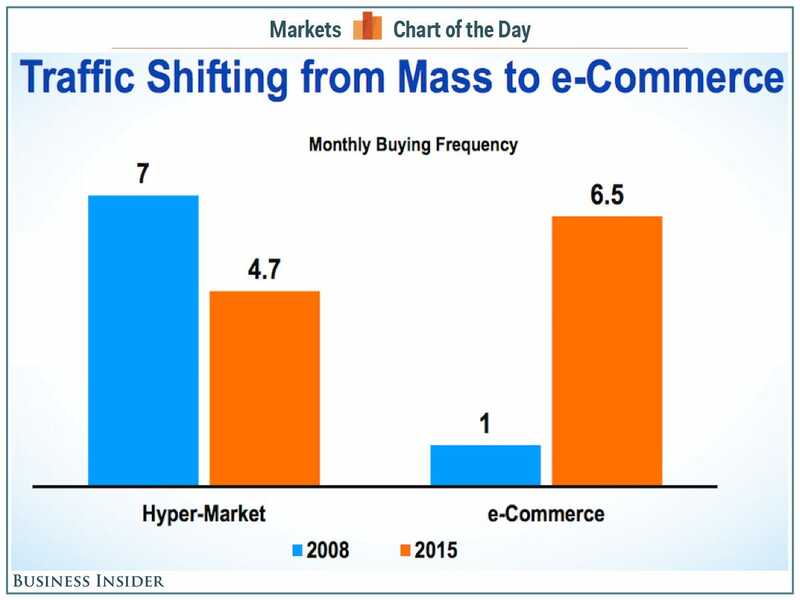 In just seven years, shoppers have shifted from making one monthly purchase on average online, to 6.5. Meanwhile, purchases at brick-and-mortar stores dropped from 7 visits to just under 5. But even as traditional retailers adapt to the shift, they face the issue of added costs, which crunch profits. The wireless industry is in a state of flux. 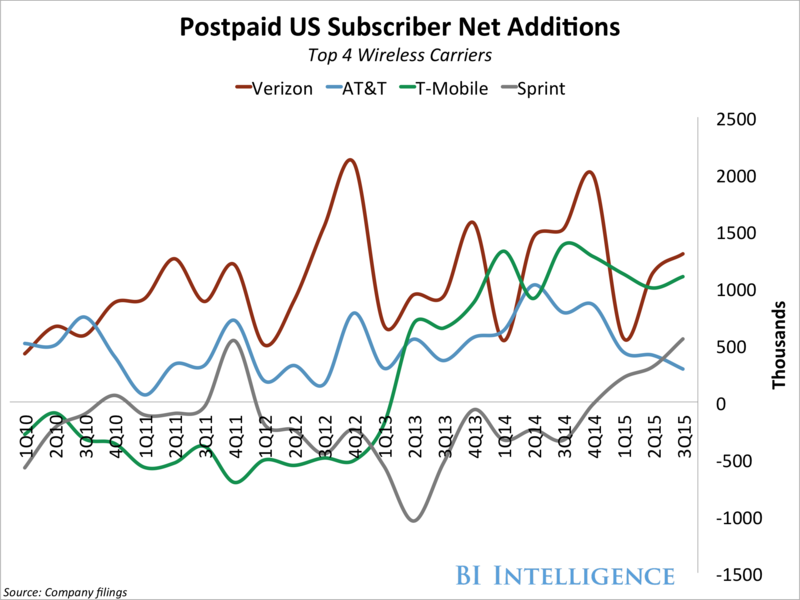 AT&T and Verizon have dominated the carrier market over the past seven years while T-Mobile and Sprint have struggled to gain subscribers. Then in 2013, T-Mobile tweaked its strategy to turn around its business. This move, along with slowing smartphone adoption and other forces in the mobile industry, killed the two-year contract and initiated an ongoing price war between carriers. The movement away from the contract model is not only changing the way carriers operate, it’s affecting the myriad of industries that rely on carriers’ services. In a new report from BI Intelligence, we examine how the wireless industry has fundamentally changed since carriers began aggressively responding to the launch of T-Mobile’s “Un-Carrier” movement. We also look at the factors underpinning changes in the broader wireless industry and the challenges carriers face in 2016 and beyond, including the upcoming spectrum auction and the deployment of new wireless technologies. The wireless carriers are not only battling over device financing, they’re also trying to woo consumers through attractive data packages. Forescout, a network security startup that helps companies keep track of all the devices on their networks, announced that it raised $76 million in its latest investment round yesterday. The new round of funding brings the company’s total valuation to more than $1 billion, tripling its valuation in just 18 months. Forescout’s network security solution is increasingly important for enterprises that deploy large numbers of IoT devices. The solution helps companies monitor all of the devices that are connected to their network at any given time. For many large enterprises that number of devices — which includes PCs, employees’ mobile devices, virtual machines used for testing new applications, and now IoT devices — can easily run into the millions, making it hard for network administrators to keep tabs on everything happening on their company’s network. Forescout’s CEO said that when the company first runs its software with a client, it typically finds 20-30% more devices on the network than the client’s IT team expected. That lack of network visibility makes it harder for enterprises to detect activity that could indicate that cyber criminals have breached their network. 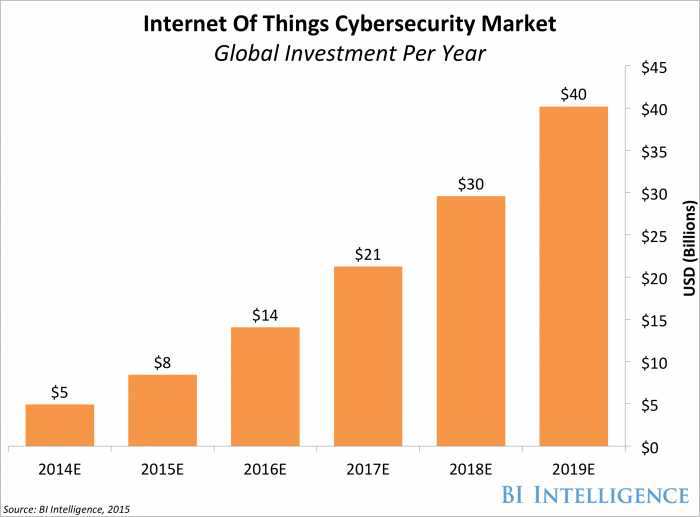 This need for better network monitoring means that Forescout is well-positioned to cash in on the market for solutions that help secure IoT devices, a market that we expect will grow quickly in the coming years. 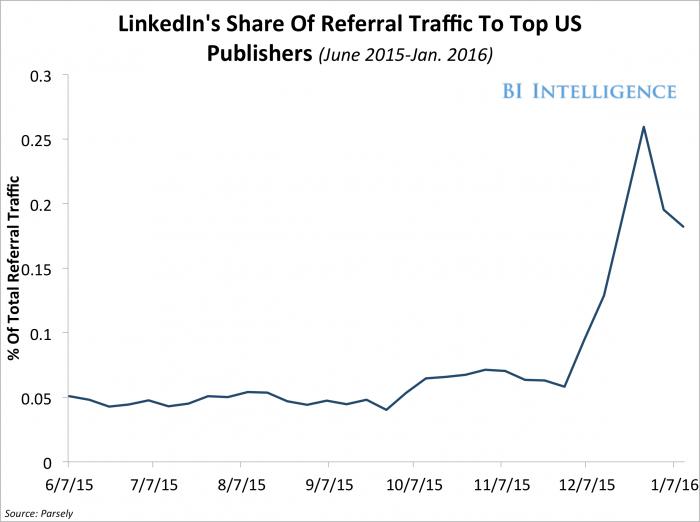 LinkedIn’s share of referral traffic to publishers has skyrocketed after it redesigned its mobile app in December, according to Parsely data shared with BI Intelligence. 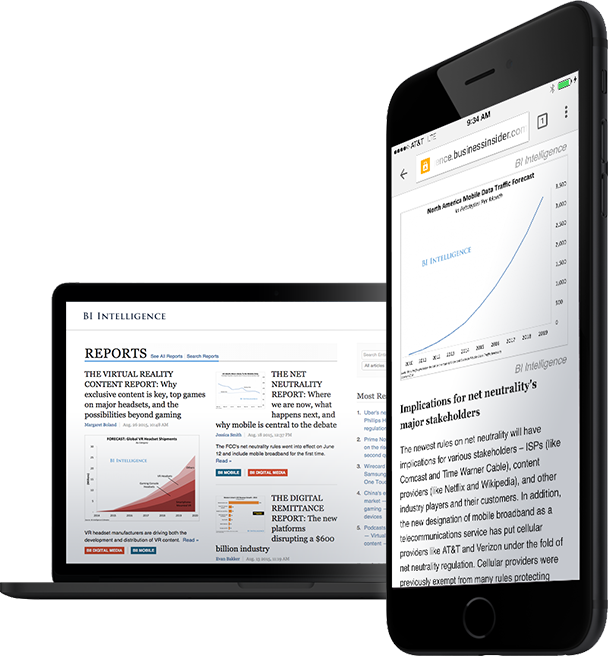 The data, which tracks traffic sources for nearly 400 digital publishers including Conde Nast, Reuters, The Atlantic, and The New York Times, reveals that LinkedIn jumped from 0.06% of total referral traffic at the end of November 2015 — right before the rollout of the mobile app redesign — to nearly 0.20% at the beginning of January. While LinkedIn’s share of publishers’ referral traffic still pales in comparison to other social sources — Facebook commands 40% of total referral traffic, according to Parsely — its increase signals that the platform’s efforts to become a distribution channel for publishers are paying off, at least slowly. Its install base is growing, but it remains fairly small. While LinkedIn’s Pulse app grew its US user base 1260% from July to December 2015, its audience is still fairly small, according to data from SimilarWeb shared with BI Intelligence. LinkedIn Pulse is installed only on 0.13% of Android devices in the US, while LinkedIn’s app is installed on 6.5%. User engagement on the apps actually fell in 2015. The number of daily active users (DAU) in both the LinkedIn and Pulse app dropped dramatically in 2015. LinkedIn DAU decreased 20% from July to December 2015, while Pulse’s DAU halved during that period, according to data from SimilarWeb shared with BI Intelligence. The way viewers are watching TV is rapidly evolving. 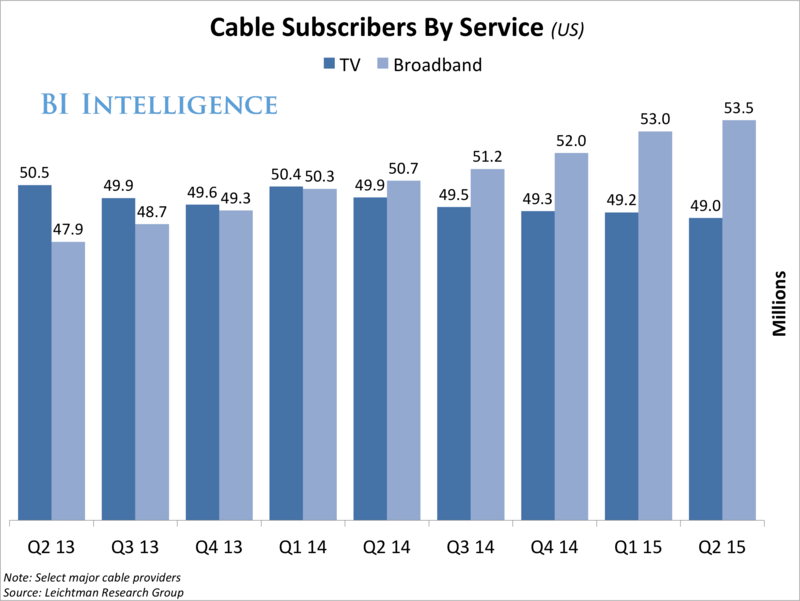 Every year, more viewers are ditching their expensive pay-TV subscriptions and opting instead for subscription video on-demand (SVOD) services like Netflix, Hulu, and Amazon Video, as well as premium services from HBO and Showtime. Rising demand for SVOD services, which allow viewers to stream the programming they want anywhere, has led many to question what the future of video entertainment looks like — and whether traditional pay-TV has a place. In a new report from BI Intelligence, we examine how the growth of SVOD services is coming at the expense of the pay-TV industry. We analyze the state of the pay-TV industry and map out which demographics are more likely to stop buying traditional TV packages. We also discuss the user base, original content offerings, and subscription models of the major subscription streaming services available today, including Netflix, Hulu, and Amazon Video. Finally, we look at how traditional pay-TV companies and premium channels like HBO and Showtime are addressing the shift to digital viewing, as well as the implications of their response for advertisers. Windows 10 might be pretty popular, but it wasn’t popular enough to rescue the PC business. IDC estimates that computer shipments actually fell 10.6 percent in the fourth quarter of 2015, making it the steepest year-over-year drop in history. In fact, shipments were scarcely any better than they were in the summer, when sales are supposed to be slower. Gartner’s figures are slightly better, although the 8.3 percent drop is nothing to write home about. Many of the familiar brands led the pack, although their shipments weren’t exactly heartening. Outside of Apple, most PC makers took a tumble this fall. US sales were kinder to ASUS and Lenovo, but not by a whole lot. And the whole-year figures are pretty sobering — IDC believes shipments fell 10.4 percent in 2015, while Gartner has them down 8 percent. Why the plummeting numbers? 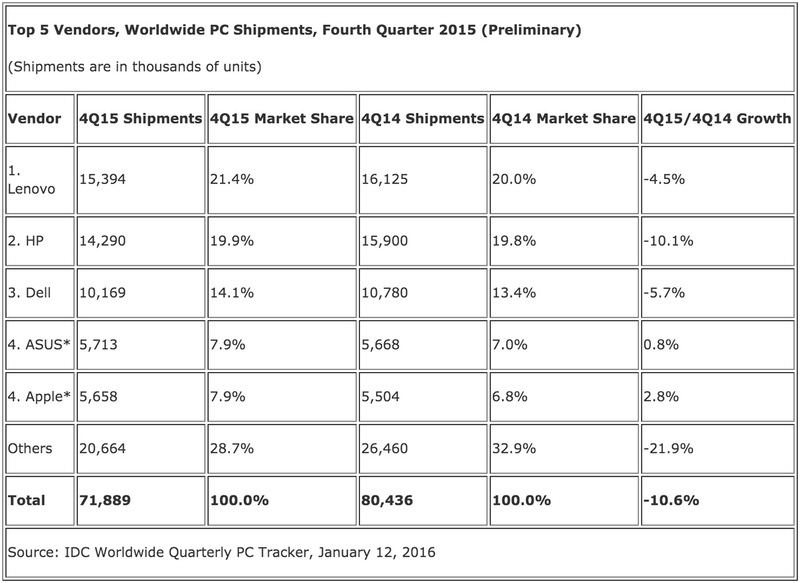 The analyst groups peg it on a combination of PC buyers’ behavior and Microsoft’s strategy. As we’ve seen in the past, PC upgrade cycles are getting longer — that old PC is more likely to be good enough for another year, especially in a world where smartphones and tablets still reduce the need for a beefy computer. And IDC notes that the free Windows 10 upgrades may have hurt PC vendors. When you don’t have to pay to get a new version of Windows, why not use the PC you already have? Whatever the cause, PC makers don’t have a lot to look forward to in 2016. They were banking on a slew of new Windows 10 PCs turning things around this fall, and that clearly wasn’t enough. While there’s a chance that a flood of clever new hardware (plus many aging systems finally needing upgrades) will help out this year, companies may have to accept that they’re in for another rough ride. Netflix subscribers watched 13% more Netflix per user in 2015 than in 2014, according to analysts at Goldman Sachs. 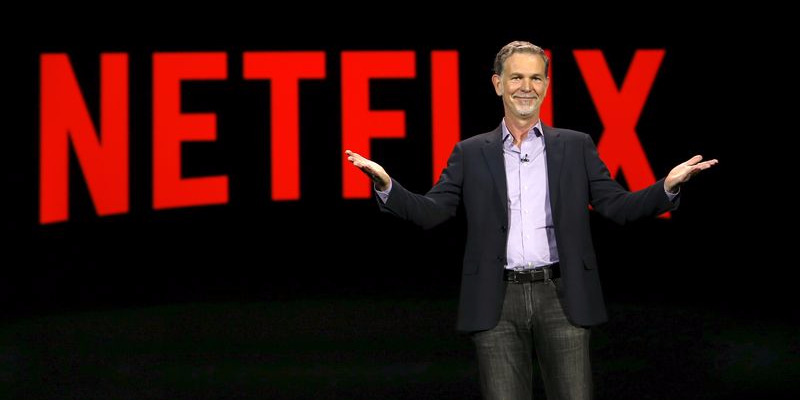 Last week at the Consumer Electronics Show (CES) in Las Vegas, Netflix CEO Reed Hastings dropped bombshell news that Netflix had expanded to 130 more countries, placing it in almost every country in the world except China. But beyond the expansion, Hastings shared numbers that suggest we are more addicted to Netflix than ever before. Hastings said users watched a total of 42.5 billion streaming hours of content in 2015, compared to 29.1 billion in 2014. Using subscriber estimates, analysts at Goldman Sachs and other firms then calculated approximately how much growth there was in the hours of Netflix watched per subscriber. The consensus was between 12-13%. This chart from UBS shows what this number means in absolute terms. 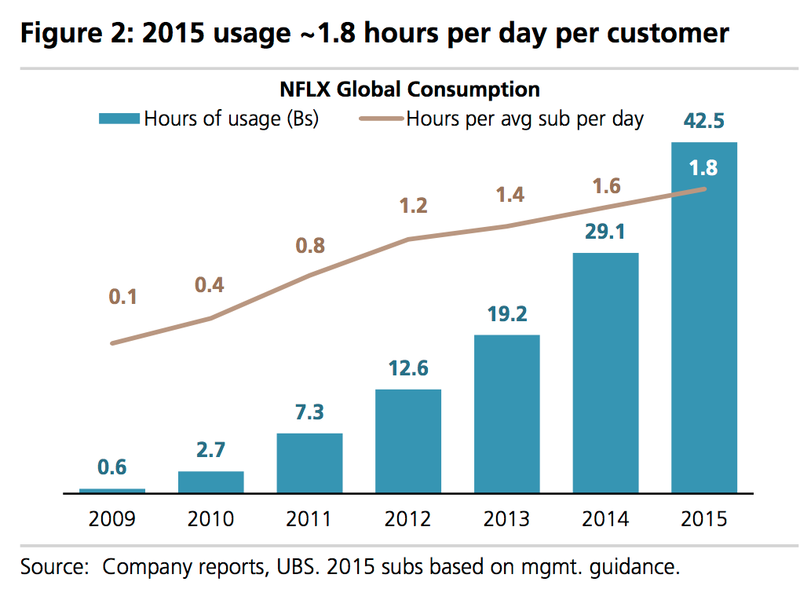 UBS estimates that hours watched per subscriber, per day, went from 1.6 to 1.8, meaning an extra 6 hours of Netflix per month. This is good news for Netflix, since it suggests that the service is becoming more valuable to people. This fact could be crucial if Netflix is forced to hike prices due to the rising cost of producing its own original content. Netflix has said it will roughly double its output of original shows to 31 in 201. That level of production will not be cheap, and Netflix has indicated that it plans to spend $5 billion on content in 2016. From cosmetics to disposable razors, personal care items are increasingly being delivered to consumers’ doorsteps as more online retailers adopt subscription services. Nearly 40% of US consumers who regularly purchase health and personal care products online say they’re signed up for at least one subscription e-commerce service. 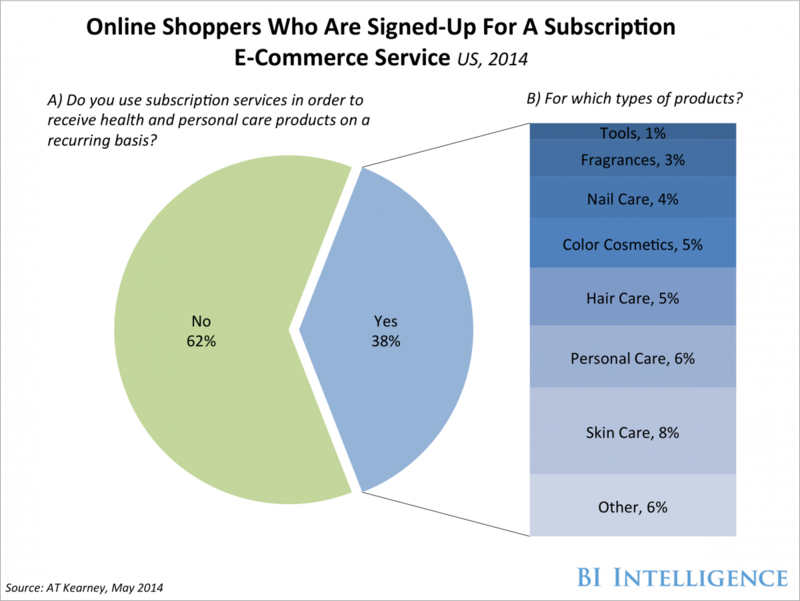 Consumers largely sign up for subscription e-commerce services for the time-saving benefits. And when it comes to products that consumers use regularly — such as those that fall under the health and personal care category — subscription services remove the need of having to make frequent trips to the store. But besides accommodating consumers’ busy lifestyles, retailers are seeing added benefits: They’re earning more revenue and building customer loyalty. For example, Dollar Shave Club, which uses the subscription model to replenish men’s grooming products, expects revenue for 2015 to top $140 million, up from $65 million in 2014. In an in-depth report, BI Intelligence looks at how retailers like Amazon and Sephora are using subscription-based models to sell and distribute health and personal care products in ways that are more convenient for consumers. We analyze all the factors that drive consumers to shop online for everyday products, and we look at which CPG brands and retailers are the most digitally savvy. Subscription shopping models can help mitigate retailers’ costs and provide an added layer of convenience to customers, and these services are helping the health and personal care category grow. 38% of US consumers who regularly purchase health and beauty products online say they’re signed up for a subscription service. Online health and personal care sales volume is expected to grow at a much faster rate than traditional drug stores sales. We forecast that the online health and personal care market will grow at a compound annual growth rate, or CAGR, of 13% between 2015 and 2020. There are a number of subcategories within health and personal care, and these have not been disrupted evenly across the board by e-commerce. We expect this to change as retailers tweak their business models. The race to win the online health and personal category hasn’t been won yet. While Amazon is the clear leader, a good number of consumers do their online health and personal care shopping on a variety of websites, including buying directly from brands that otherwise would not have a direct channel to consumers. Our subscribers consider the INSIDER Newsletters a “daily must-read industry snapshot” and “the edge needed to succeed personally and professionally” — just to pick a few highlights from our recent customer survey. If you’ve been looking for for a hand-sculpted Gothic dragon weathervane, you now have a new way to find it: Amazon’s Handmade online store. As rumored earlier, the new venture has arrived in response to the success of Etsy, the artisan-goods company that just went public with a massive $3.5 billion valuation. The store is divided into seven categories, including jewelry, home decor, artwork and furniture. That’ll give you a chance to find some one-of-a-kind paintings, along with items like leather magnetic cuffs, walnut rocking chairs and a beer growler holder. 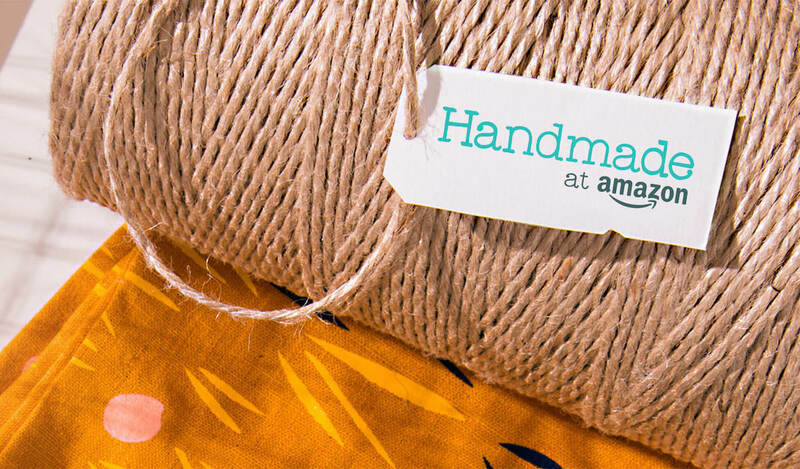 Amazon has 80,000 items in the store already from artisans in over 60 countries around the world. The company told the NYT that “you can think of it as a factory-free zone… we’re going to launch with an experience that’s very different.” The retail giant has promised that every item is genuinely handmade, and every artisan has a profile on the site so you can see how they make their items. Meanwhile, Etsy recently allowed vendors to outsource manufacturing, and has faced questions over counterfeit goods on its site. However, artisans have expressed concerns over the higher fees that Amazon charges, and think that the corporate vibe doesn’t mesh with craft culture. Either way, Etsy will be in tough against Amazon, which is the largest retailer in world and has over 10 times the customers of its artisan rival. Many digital media companies have embraced monthly and annual subscriptions and now Apple has gotten into the business with its Apple Music service. The subscription model allows digital media companies to provide a premium experience that offers more than the basic, often ad-supported service level. Subscriptions are enjoying a new prominence as a revenue model for digital content and apps. Internet companies are exploiting the opportunity to boost ARPU (average revenue per user), thanks to recurring payments from a subscriber base. Most companies operate on a “freemium model.” Subscriptions typically operate alongside an advertising business. 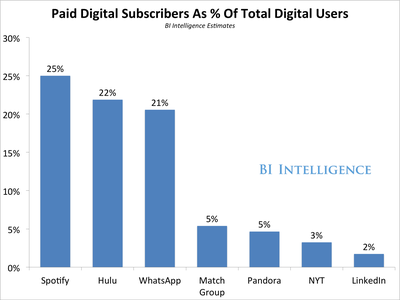 The proportion of paying subscribers within the total user base varies considerably across digital media industries. Each category is obviously different, and won’t face the same challenges and opportunities in dialing up the percentage of subscribers and subscription revenue. Here are some of the proportions of subscribers in apps’ user bases: Spotify (25%), WhatsApp (21%), Pandora (5%), Match Group (5%), The New York Times (3%), and LinkedIn (2%). 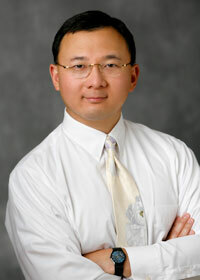 The report is full of charts, data, and case studies that can easily be downloaded and put to use.